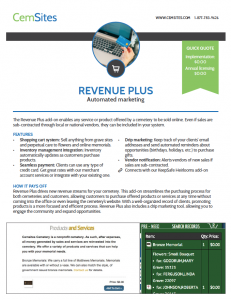 The Revenue Plus add-on allows any service or product offered by a cemetery to be sold online. Even if sales are sub-contracted through local or national vendors, they can be included in your system. Sell anything from gravesites and perpetual care to flowers and online memorials with the Revenue Plus shopping cart system, where clients can use any type of credit card. A built-in drip marketing tool keeps track of clients’ email addresses and sends automated reminders about opportunities (birthdays, holidays, etc.) to purchase gifts. Revenue Plus even alerts vendors of new sales if products are sub-contracted. This add-on can work with our Inventory Manager add-on to automatically update inventory as customers purchase products. Revenue Plus can also be used in conjunction with the KeepSafe Heirlooms add-on to sell online pages to which clients can add information about both living and deceased loved ones, creating a lasting legacy for future generations. If you would like a printable PDF of information on our Revenue Plus, enter your email and we’ll send it over.